I was honored to premiere my mini-documentary "THICK: Black Women Weigh In on Body Awareness, Food, Stress and Self-Care" recently at the Black Women’s Life Balance and Wellness conference at Spelman College in Atlanta. Featuring the stories of nearly 20 Black women nationwide – myself included – the film asks how can we take care of ourselves in the face of stressors like job demands, relationship issues, family drama. 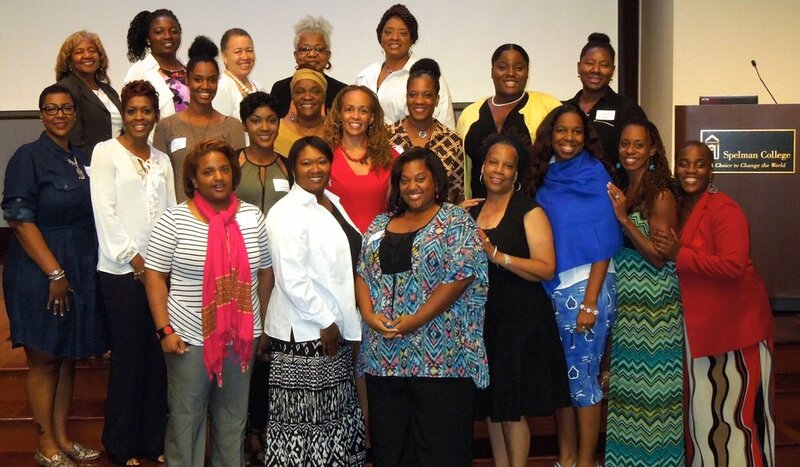 Black Women's Life Balance and Wellness conference, Sept. 19, 2015. THICK centers on healthy weight, as Black women contend with weight-related health concerns like heart disease, diabetes and fertility problems in disproportionate numbers. This project was a part of my master's thesis, which focused on using narrative techniques like storytelling and writing to promote healing among Black women. Joining us were two of the sisters featured in the film who are from Atlanta. They loved seeing their stories on the big screen. One, Elizabeth Montgomery, shared that she was thrilled to go from "homeless" -- a reference to her tenuous life as a young adult -- "to Hollywood!" We followed the film with a powerful writing workshop focused on the body and self-care. The women gathered, wrote and witnessed, and some shared from deep within their hearts. I now incorporate narrative techniques in my coaching work. A beautiful thing about writing for healing is that it is a way to get your “stuff” down on the page. Sometimes you don’t even know what you’re struggling with until it’s there in front of you, talking to you, telling you about itself. And once you name it, whatever it is, you can begin to deal with it. I look forward to showing "THICK," to writing and sharing our stories, and to continuing conversations about what it takes to be healthy and whole. Click here for a preview of "THICK," and let me know what you think at robin@robinstone.com.